Can't attend? Follow King's Night Party - Koningsnacht to know of future events! The biggest orange party is back again! If you've missed out on last year's celebration, be sure to join in for a whole night of fun this time on Tuesday, 25th April 2017! Dance to Dutch music all night! 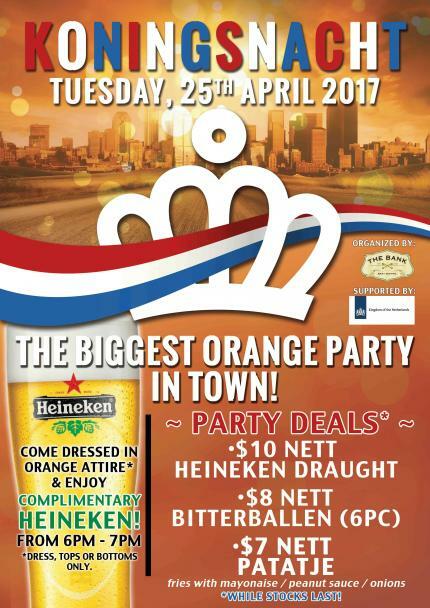 Come dressed in orange attire* and enjoy complimentary Heineken Draught from 6 - 7 p.m.
*Orange dresses, tops or bottoms only. Register your interest in attending the party with us and we can estimate the amount of your favourite Bitterballen to prepare which was SOLD OUT very quickly during our previous Dutch event.